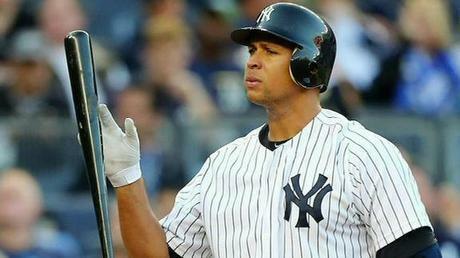 Will Alex Rodriguez Be In Yankee Pinstripes in 2013? The New York Yankees are currently caught between a rock and a hard place, staring down a 0-3 deficit in a best-of-seven American League Championship Series against the Detroit Tigers. Game 4 was initially going to take place Wednesday, and the struggling Alex Rodriguez was in line to be benched for his second straight game in the series before the threat of rain pushed the game to Thursday, thereby giving Yankees' manager Joe Girardi another opportunity to make some changes to his lineup card. Only nothing changed. When the Yankees handed off their lineup card to the umpire on Thursday prior to Game 4 of the ALCS against the Tigers — a game that ended in a 8-1 defeat for the Yankees and a clean sweep for Detroit — struggling players like Curtis Granderson (3 hits, 16 K's, and a batting average of .100 through 30 AB's), Nick Swisher (5 hits, 10 K's and a batting average of .167 through 30 AB's) and Alex Rodriguez (3 hits, 12 K's and a batting average of .120 through 25 AB's) remained absent from the lineup. The most glaring absence was that of A-Rod, who, despite his recent struggles against right-handed pitching up to that point (3-23) still probably should have been in the game considering he had homered twice off Tigers' starting pitcher Justin Verlander back in the regular season. But then again, maybe Girardi made the right call. Even if it was Verlander on the mound for Detroit, there was also the undeniable fact that he could be looked at as just another right-handed pitcher that A-Rod simply couldn't buy a hit off of. Considering Rodriguez made $30 million in 2012, the fact that he couldn't buy a hit tells you that he's in a ridiculous slump; one of the worst he's gone through in recent memory. Swisher, Granderson and Rodriguez were all watching from the pine when the Yankees' season came to an unceremonious and premature end. My belief is that Granderson will be back in 2013 while Swisher very well could not be, but what about A-Rod? Rumors have been swirling (much more so during A-Rod's slump at the plate) that he could be bound for the Miami Marlins if he's willing to waive his no-trade clause, however, according to a recent Yahoo! Sports report via MLB.com's Bryan Hoch, that's not something that Rodriguez is even considering at this point. As of right now, no other teams have really shown much interest in the 37-year old slugger, which, considering he is still set to make $114 million over the remaining five years of his contract through 2017, is not surprising no matter how much of the contract the Yankees might be willing to "eat." My guess is that will all blow over eventually during the off-season and that A-Rod will be wearing Yankee pinstripes for the foreseeable future. After all, unless he changes his mind about waiving his no-trade clause, the Yankees can't move him even if there are other interested suitors. I'm not sure why Rodriguez would want to try and solve his hitting woes under the bright lights and scrutiny of New York which is arguably the most volatile environment in all of sports, but more power to him. Hopefully for his sake, this off-season can help A-Rod find his swing again sooner rather than later.